This is my 4th effort inspired by my recently acquired Marshall Plexi. This tune is called “Lead Rhythm”. Like my previous post, this tune is from a few years back. I released the 1st version of this tune on my CD “Sunflower“, which is available on CD Baby if you click the link. Since I got the plexi, I’ve been looking back to some of my previous, more rock-oriented numbers. This is again what I would call an “updated” arrangement. The head alternates 8 bars of what is a riff-based section with 8 bars of something of a melody. I’m not sure if it’s apparent, but in certain sections I was trying to get some of the feel of the ending section of “Layla” to contrast with the more hard-rock oriented sections. 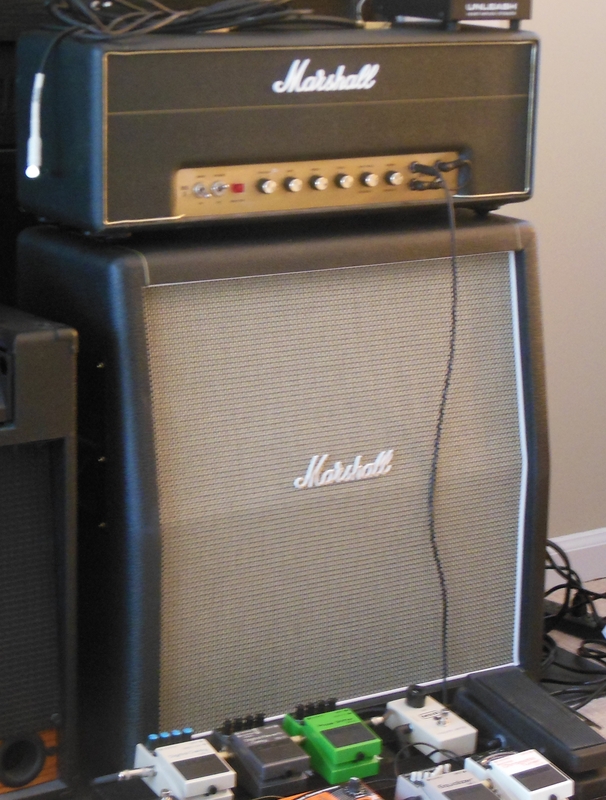 Again, the guitar is not actually recorded through the amp, but rather my old Pod Pro. Entry filed under: bass guitar, Classic Rock, Guitar, jazz fusion, Music, Pro Tools, ProTools, Rock, Sibelius. Been awhile since I’ve had a chance to listen to your current offerings, and as expected, your playing is excellent, great ideas, with well done grooves. However, I’m not getting a good balance in the mix, I don’t know why for sure, but I suspect you need to go through a “finalizer” or multi-band compressor to get things in the right perspective. The idea is to split the frequency range into about 6 parts, and then level/EQ them within each band/part, then to each other. That brings out the solo ax on instrumentals perfectly, and balances the back-up band to sheer perfection. Of course, your ears will still have to tell you how to tweak it for your personal taste, but once you hear it, you’ll immediately know what you need to do next. I’ve tried some of the Mastering algorithms on a couple of direct-to-disk recorders, a couple VST plug-ins for Logic Audio, and they all worked pretty well (a modest improvement to the final mix), but not NEARLY as well as the actual hardware multi-band compressor. Anyway man, that’s what I’m getting from listening to both this most recent download, AND going to CD Baby and listening to several of your preview tracks, there. Check it out bro, and GOOD LUCK!